Did the first round of the MSC series this weekend here in Fruita. I skipped out on the TT on Saturday, but hung out at the event all day. The weather was bluebird skies and 70 degrees. I finally got out for a ride about 3:30pm and rode the first 6 miles then came back the return route. Sunday the weather was just as nice, but a stiff headwind the first 10 miles of the course. The first 10 miles were 2-track with some rollers and sand. A few pileups, broken chains, and people stuck in sand blew the pack up a bit. Suffered the first 45 minutes to the top of the mesa before riding for 30 minutes on what felt like a paint-mixer. Rough. I hit the wall after 1.5 hours and suffered bad the next 50 minutes. I thought it was the big effort the first hour and the no recovery, but it could have been the food. A bowl of granola with a piece of bread at 8am might not hold me until the 12:45 start time. And 2 gels for 2:20 might not be the smartest idea. Ah well, it was fun and we picked off people near the end. 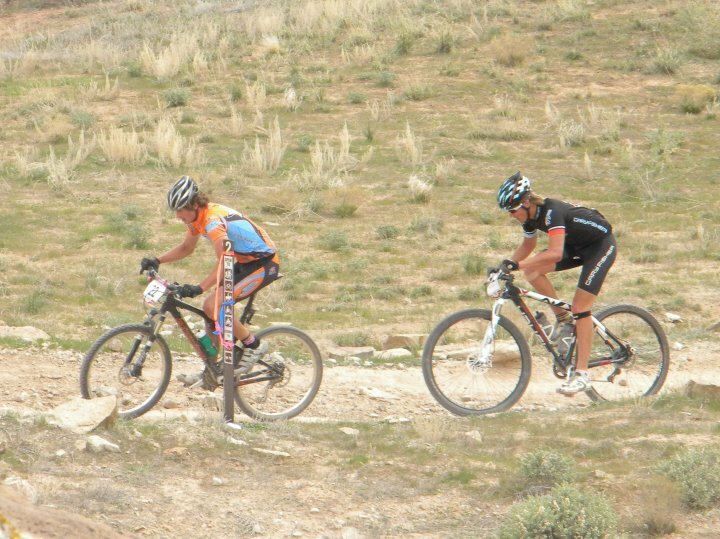 I thought I was near the back of the pack, but I ended up 34th of 54, so not too bad for early season riding. It is finally time for me to start hitting the blocks and training hard for the important races later this summer. It all starts tomorrow morning! Can't wait to suffer and start becoming fast again! Last weekend was awesome. After traveling every week/weekend for the last couple months, I am finally at the stage where I get to stay home. This is the PERFECT time of year to be here. Last weekend I was able to get out and enjoy the awesome trails in the valley, a majority of the stuff I never get out and ride. The weather was top notch, with highs in the upper 70's and bluebird skies. Couldn't ask for better weather. Pre-rode the Rabbit Valley course with Mike on Saturday. There's a MSC race there next weekend which could be entertaining. Not my type of course, but it will shake stuff up. Went back out to Fruita Sunday and did a sweet exploration loop on many of the lesser-ridden trails at 18Rd. Got in some good climbing with a nice mix of dirt roads and some super buff 1-track. This weekend we have the race at RV on Saturday and Sunday. I'll likely just do the XC Sunday as registration fees are way high. Has the price of promoters insurance skyrocketed in the last year? Everything else in this economy is becoming cheaper as disposable income has shrank with lack of dollars flowing through peoples pockets. All the races I have done this year have been over $50. I can maybe see $50 for a sweet XC in the pro class where they are paying out, but $45 for a 20 minute TT on Saturday is whack. So, I might head down and hang out, or I might go on up to Ranchstyle. Nothing like watching a bunch of freeride nutjobs ride crazy fast and hit mega-air. 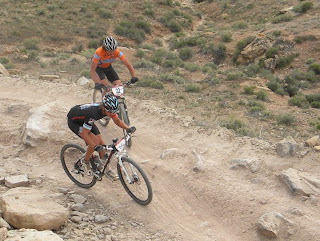 Next week is the Fruita Fat Tire Festival. First time I have ever been in town for it. Some people from the mitten are headed down so it should be fun to show off some of the local jems. After that, it is time to buckle down and get serious about riding bikes. Need to get fast for the summer. I also am done with school in a couple weeks. I'll get one of those expensive pieces of paper that says I'm edumakated. -Had a fun trip down to Fontana for the first Pro XCT a couple weeks ago. -Did a good pre-ride Friday with a bunch of the U23 guys. 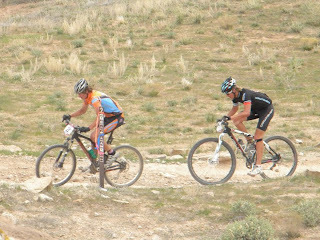 -Wrecked hard on the pre-ride and lost some confidence. -Race day was alright finishing in the 50's of 90 pro guys. -The 34T chain ring was a painful grind up the elevator climb.